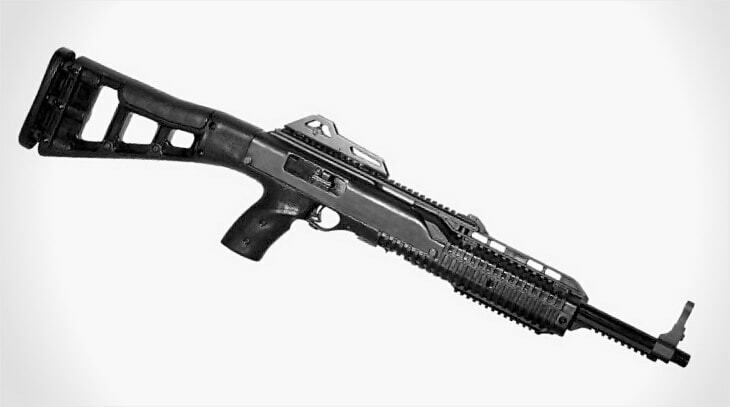 Hi-Point is well-known for their low-cost, inexpensive, and let’s be honest, cheap guns. No matter what your opinion is of their quality or style, it’s impossible to deny the fact that they make reliable pistol-caliber carbines at a price that smokes the competition. In something of a surprise move, Hi-Point is expanding their carbines with a new caliber, .380 ACP. And that’s not a bad thing. The majority of .380 pistols are blowback, which means that they can have a surprising amount of recoil. That’s just as true for Hi-Point’s pistols as any others, so while they’re adequate in a bind, they’re not ideal for self-defense. Pistol-caliber carbines, blowback or otherwise, are extremely comfortable to shoot, not to mention easy and intuitive to use. So what are the benefits of a .380 carbine? Besides being easy to handle, they provide existing .380 owners a way to consolidate on calibers, and other shooters more options. If you’ve shopped for ammo recently, you may have seen that some cartridges just aren’t available. If your friendly local gun store is just as stripped as the big box retailers nearby, you might have to turn to .380 for protection. While the handgun cartridge is generally seen as the bare minimum needed for self-defense, out of a carbine it performs much more impressively. According to real-world testing by Ballistics by the Inch, common .380 ACP loads fired out of a 16-inch barrel can exceed 1,300 feet per second and generate around 350 to 400 foot-pounds of force at the muzzle, or just about double the energy that they make out of small handguns. And that’s with standard loads, not over-pressure rounds by boutique ammo manufacturers. The carbine-length barrel puts .380 in a different league where self-defense is concerned. On top of that .380 is generally loaded with lighter weight projectiles that will penetrate less through barriers like interior walls if they miss their target. Weighing in at 7 pounds, the words “non-existant” come to mind when thinking about the recoil from this .380 carbine. This gun is guaranteed to be soft-shooting and, relatively speaking, quiet. All this is to say, while .380 ACP is the minimum for personal protection, .380 out of a carbine is more than the minimum. Which is great, in a small sort of way. This carbine is about options and it gives existing Hi-Point .380 owners something else for home defense and fun at the range. Like the rest of Hi-Point’s carbines the .380 uses standard Hi-Point pistol magazines, in this case, .380 mags. Of course, .380 ACP isn’t the least expensive cartridge on store shelves today. It’s not outrageously priced but the sticker on this gun will go a long way to covering the cost of ammo: the Hi-Point .380 carbine is listed at just $297. While it’s not possible for the street price to be a couple hundred less, at around $250, Hi-Point’s carbines are the least expensive on the market. While their pistols don’t have the best track record for dependability, it’s hard to find owners of Hi-Point carbines with much of a beef about their rifles. As long as you use magazines and ammunition in good condition, the guns pretty much just work. Hi-Point will be selling these .380 carbines in a variety of configurations in addition to the base model with tactical foregrips, lasers and red dot sights for people who want to operate with their .380 carbines.